Tomorrow, once again, our students will go out to the villages on outreach, sharing the love of God and the good news of Jesus Christ. One of my responsibilities is to visit the teams when they are away, ensuring that all is going well and touching base with them to encourage and pray for them. 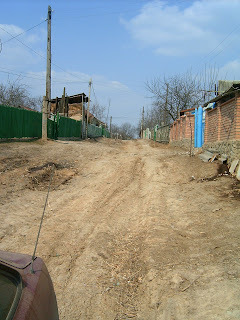 A few weeks ago we went to visit a team in a large village not too far away from Chisinau. We arrived just in time for the morning worship service, entering into a packed church and somehow finding a bench to sit on. 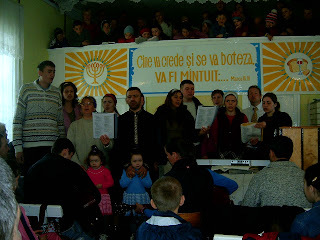 Our team was participating in the service and here you see them singing. Among our students is a married couple with absolutely adorable twins. Can you spot the twins? The tall guy in the photo is the team leader, a guy named Spirodon. Behind the team you can see the balcony, which in this case became the 'overflow' area. For several days the team had been serving in this area and I am not sure if the church is always this full, but some of the people attending were new believers who had come to faith through the testimony of our students. At the end of the service those people eagerly went to the front, when called upon, to publicly profess their new-found faith. It was exciting to be there. After the service, we were invited to join the team for their free afternoon as they were going to the 'forest' for a barbecue. It was a beautiful spring day so I was happy to be able to spend some time with them. We didn't have directions but we were going to follow the truck driven by one of our students, which carried the whole group in the back. 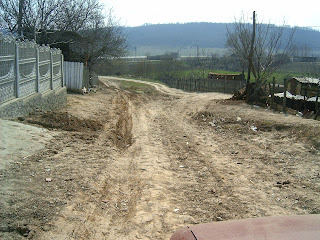 That was fine until, carefully picking my way down the rutted road behind the truck, I got left behind. We turned a corner and Slavic and his truck had disappeared. In every direction the road looked absolutely impossible to drive on. I wasn't sure which way to go, or indeed, which way I COULD go! A lady walking along suggested we head down the hill and described how to get where we were going. I started down the hill and at one point stopped and took these pictures - not sure whether to go back or forward! The photo on the left is where we had been and the next photo is where we were about to go! It seemed impossible but my trusty little Ford eventually got us there. More than once I was convinced we were destined to lose the bottom of the car or get stuck in a river but we fortunately had the services of a young boy whom we had seen at the church. 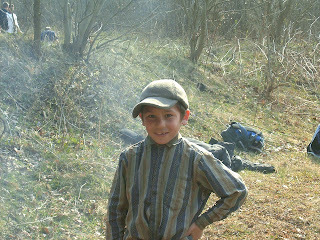 He was whizzing around and in front of us on a bicycle 5 times too big for him, and guiding us to where we needed to go. Here is the photo of our intrepid guide, who coaxed, urged, led and encouraged us towards our seemingly unreachable destination. Once we got there we realized that we could have gone back the way we had originally come and it would have been far easier - but not nearly the adventure! Spring flowers were blooming and the girls were enjoying picking nosegays and everyone was relaxing. The group gathered sticks and got a fire going and someone brought the bucket full of chicken, which had been kept soaked in beer, and was then cooked over the open fire. 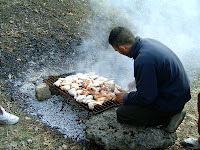 This is a Moldovan style barbecue. It was a lovely afternoon and I expect to be equally blessed at the next opportunity I have to visit an outreach team. 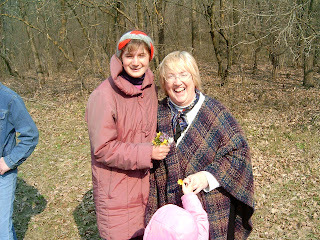 This is me with Olga, one of our student leaders. Posted by Barb at 4:20 p.m. I'm praying for you, Barb, and for the PLM teams! Thanks for updating...I just LOVE seeing pictures of my friends! Please tell Olga, Slavic, and Spirodon "salut" from me. What village were they in?